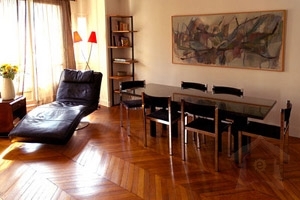 This elegant Paris apartment on the left bank of the Le Passy, an excellent choice for a couple with older children, is located in one of the most desired sections of the city. 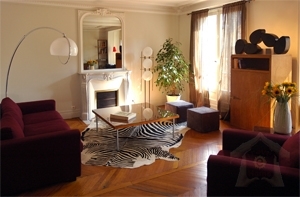 All of the main sights are within walking distance or metro ride of this chic apartment rental in Paris. Not only is this a perfect pied à Terre for those wishing to be centrally located, it is also charming and well-equipped. In the dining room a floor to ceiling picture widow, overlooking a typical Parisian courtyard, with dark wood plantation style chairs and black and white floor tiles give this room and appealing sophisticated air. The serene master bedroom overlooks the quiet street and provided high thread count luxury. The king bed can be divided into 2 singles, as needed. The master bathroom is a grand affair with white Italian marble and comprises a deep tub with shower, double sink vanity and separate WC. The open-plan kitchen has white Italian marble surfaces, gleaming white cabinetry and modern stainless steel appliances. A full-sized fridge and dishwasher, All-clad cookery and Le Cube style Espresso machine are added pleasures in the kitchen. 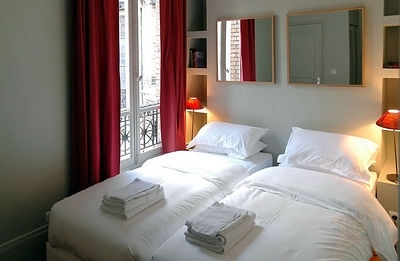 Other attractions in the area include the Hotel des Invalids to the south, the Jar din des Tuileries just north across the river, the Champs-Elysees, and the Louvre.